Wine of Fatima Valley, Argentina. Fairtrade. Organic wine. Wine - Argentina's National Beverage. Suitable for vegetarians. 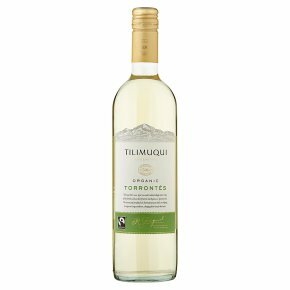 Brimming with green melon and peach aromas, this unoaked Torrontés is dry, with a delicious citrus flavour and a crisp, lingering finish. A perfect bottle for special get togethers, parties or to simply have in the fridge ready for unexpected guests! Great on its own, or equally as good with fish, seafood, salads, chicken and spicy dishes. Serve chilled. We hope you enjoy it!